Surveilstar monitoring software can be used as a Skype monitor which enables you to record Skype conversations and avoid the personal, business or other information from being leaked via Skype chats. SurveilStar is a well-developed monitoring software with strong technique support on various kinds of on-line chatting tools, including the proprietary Skype. It offers a full control over all Skype operations by pc users, not requiring an expert level on using both the IM tool and Surveilstar. All the Skype chatting conversations will be automatically recorded by Surveilstar thus creating a safer environment for avoiding data leakage. Skype has been widely used for on-line chats especially the real-time one-to-one chat type. It is just like a telephone on the Internet with faster connecting speed, lower fee when compared with a real phone service. Because for people in some countries, using a Skype means you may not have to pay extra monthly fee on these communication services. Besides, Skype is just like any other IM tools, supporting files transfer, video chats, groups discussions. All the popular elements make it one of the the top IM tools and develop a large number of users all over the world. Despite the users' nationalities, religions, backgrounds, they all share a same or similar instant messager to talk with friends, family even strangers. This is amazing but also makes our consciousness of keeping chatting conversations being watched out much stronger. Because none would be happy to see personal privacy, business secrets, working information or something else being breezily talked about on Skype but finally end up by spread gossip. What's worse, you may be set up before being aware of the cheat. Since Skype has played such a important role in our daily life, it is necessary for us to be noted about what were talk about on Skype. Confidential information may be leaked on every possible conversation. In order to monitor Skype and record Skype conversations in time to get rid of necessary problems, a Skype monitor could help us a lot. Though the Skype is claimed to be a secure communication, encryption cannot be disabled, and is invisible to the user. This does not mean it is unbreakable and unable to be monitored. For example, if you have the administrator privilege, the full details of members with business accounts including time, date, duration, destination number of all calls and text content can be viewed and recorded directly. 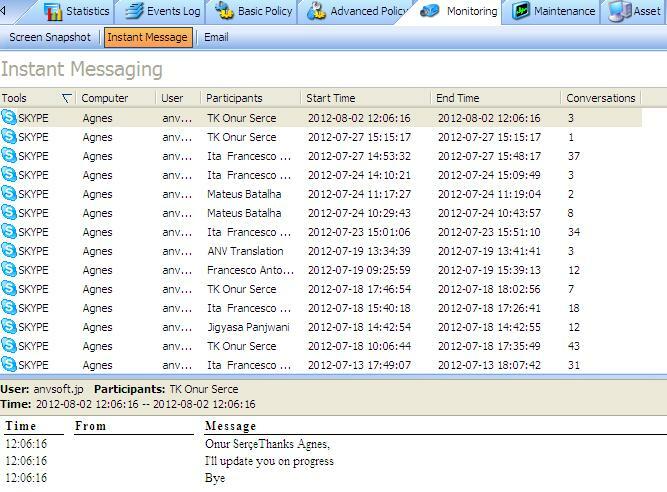 Besides, if you are not the administrator, a simple monitoring software could do the Skype monitor too. There are many software options for you to choose on the current market. You could search one on the Internet, ask via forums, or read software/software company reviews for reference. 1. Separately install agent and server & console on different computers- agent for monitored computer, server & console on monitoring computer. 2. After your restart all computers and enter the console. Click "Monitoring"> "Instant Messages". The recorded Skype content will listed there. 3. You could save the records as backups or scan details thus getting away from possible data leakage. Try Surveilstar Skype Monitoring Software with 30days, 5 computers monitoring trial Now!